KINNECT offers a fully-managed occupational immunisation service, either conveniently on-site at your workpalce, or within a locally based clinic. Site-based immunisation is an excellent option for those locations concerned with down time associated with such a program, whilst maximising coverage of all personnel. The immunisation program will be coordinated by a dedicated account manager at KINNECT and contact details will be provided at time of confirmation. It is recommended that Serology testing always be conducted prior to any immunisation program so as to determine whether there is existing immunity and identify those that are at risk of contracting the relevant disease and therefore require immunisation. In addition to identifying those who are at risk, results may indicate that a ‘booster’ vaccine is only necessary. Vaccination should be considered for first aid givers and persons who work with and in rural and remote sites and indigenous workers. Vaccination should also be considered for those who may be exposed to sewage at work, such as plumbers and food workers. Hepatitis A Vaccine is given as an intra-muscular injection and the immunisation program for this vaccine consists of two injections 6 to 12 months apart. Please note that a combined vaccine against Hepatitis A and Hepatitis B is available. Hepatitis B vaccinations are recommended for all, and is now included in routine Australian infant and childhood vaccinations. As a standard Hepatitis B immunisation is required for all people working in a First Aid/Medical capacity. There is good evidence that a successfully completed primary course of Hepatitis B vaccinations provides long lasting protection in normal (immuno-competent) individuals. If the primary course has produced a protective level of antibodies as detailed previously routine boosters are not recommended. The Hepatitis B vaccine is given as a intra-muscular injection and the immunisation program for this vaccine consists of three injections, the initial vaccination, the second at one month and the third at six months. This program should be followed by a serology test to confirm that the individual has been successfully immunised. Although given as a standard course, Hepatitis B and Hepatitis A/B vaccinations, can be given rapidly if a faster immunity is required. Tetanus can occur anywhere. Due to the availability of effective vaccines, tetanus is now a rare disease. Immunizations recommended for adults may relate to your age, your Indigenous status, your occupation, if you have had injury or illness, your vaccination history, plans to travel, or just part of staying healthy. Adults with a tetanus prone wound should receive a booster dose if more than 5 years have elapsed since the last tetanus dose. The recommended 3-dose primary schedule is at 2, 4 and 6 months. A single dose is recommended for people over the age of two who are travelling to endemic regions where food hygiene may be sub-optimal and drinking water may not be adequately treated. Persons born after 1966 – should have documented evidence of 2 doses of MMR-containing vaccine (administered at least 4 weeks apart and with both doses administered at ≥12 months of age; or have serological evidence of protection for measles, mumps and rubella. A course of 3 doses of IPV (IPOL) or IPV-containing vaccines is recommended for the primary vaccination of adults. No adult should remain not vaccinated against poliomyelitis. persons ≥9 months of age travelling to, or living in, an area with a risk of yellow fever virus transmission. Blood serology test conducted prior to a tetanus immunisation to determine whether there is existing immunity, identifying those at risk of contracting tetanus thus requiring immunisation. The administering of a tetanus immunisation at your workplace or within local a clinic. 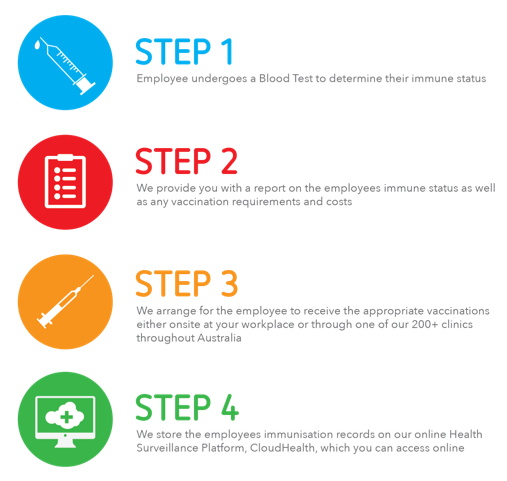 Blood serology test conducted prior to a hepatitis immunisation to determine whether there is existing immunity, identifying those at risk of contracting hepatitis A and/or B, thus requiring immunisation. The administering of a hepatitis A and B immunisation at your workplace or within a local clinic. The administering of a hepatitis A immunisation at your workplace or within a local clinic. The administering of a typhoid immunisation at your workplace or within a local clinic. The administering of a rabies immunisation at your workplace or within a local clinic. The administering of a measles, mumps and rubella immunisation at your workplace or within a local clinic. The administering of a yellow fever immunisation at your workplace or within a local clinic. The administering of a polio immunisation at your workplace or within a local clinic. The administering of a varicella immunisation at your workplace or within a local clinic. Immunisations are administered by either a registered Medical Practitioner, Nurse Practitioner or Nurse Immuniser. How long does the immunisation take? Vaccination appointments can be made either before, during or after work. KINNECT are able to accommodate specific appointment times and dates to minimise operational disruptions. Clinic based vaccinations take approximately 15 minutes per person. Onsite vaccinations take approximately 5 minutes per person. Contact KINNECT to discuss our Occupational Immunisation Programs further.